Wash and soak 3 cup rice and 1 cup udad dal in separate container for 8-10 hours. Then roughly grind them separately and mixed it well in a container and keep it for 8-10 hours for fermentation now the mixture is almost double. Now mixed both the better add salt to taste a table spoon cooking oil and mixed it and make a smooth batter. Greece the idli molds with cooking oil. 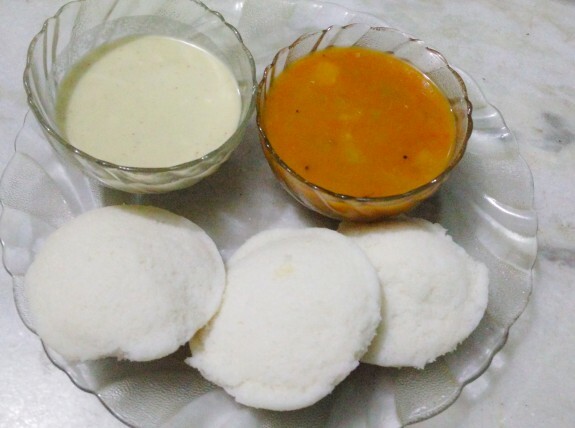 Pour the batter in the idli moulds steam the idli into steamer or pressure cooker. Cook it for 10-12 min till idli cooks. And the yummy and soft idli is ready to serve. Serve it with coconut chutney and sambar.